Best Double Jogging Stroller of 2019: Let Your Babies Come Along for the Ride! Home » Baby » Gear » Best Double Jogging Stroller of 2019: Let Your Babies Come Along for the Ride! Jogging is a great way to burn calories, release some serotonin and explore the outdoors and thanks to jogging strollers you can now travel as a family unit especially when coupled with the best travel system. Naturally, many parents feel limited when it comes to finding the time and space to exercise; when you’re not attending to their every need, you’ll probably find yourself doing everyday chores and before you know it you’ve spent another day stuck indoors. Jogging with the best double jogging stroller offers an all in one solution – you are able to explore the outdoors as a family, and you gain the space and time to exercise any time you want, but best of all you get to do it while having fun with your kids. In order to do this effectively and safely, you need a high-quality, genuine jogging stroller that will allow you to run with your kids any day you wish, which will improve your well-being and keep them comfortable and entertained. The colorful BOB Revolution Flex Duallie is fantastically practical; boasting a whole range of features to make your life easier when you are out and about with this stroller. Even when you’re not using it, the stroller can be folded ever so easily into its flat, compact form, so that it can be stored away and transported without any fuss. Adjustable padded handlebars make this stroller highly customizable to you with there being nine possible handlebar positions for jogger parents of all heights. On top of the pragmatic handlebars, the suspension system is also of a modern design and has no problem in reducing any turbulence from uneven terrain during the run. The materials that this stroller is made from are high quality and are used for their characteristics which benefit this product greatly. From the durable but light aluminum alloy frame to the water-repellent fabric seat covers, this stroller was built to take punishment from the elements and not be affected in the slightest. It features quite a handy storage on the underside to bring all of your diapers, spare clothes, food, drink and whatever else you can fit with you as you explore the outdoors with your kids. Additionally, the large retractable canopies (one for each seat) are superb for keeping out rain and harsh sunlight and the reclinable seat positions offer your kids many options for comfort. The final feature to talk about is the car seat compatibility. You can buy a car seat adapter which is sold separately which allows you to attach a compatible car seat to the stroller. This is a fantastic option for parents who often go on car journeys with their children as the stroller can be easily stored in the trunk or back seat and the child can be put in the stroller straight from the car and off you go. Another one of the best double jogging strollers is the Baby Trend Expedition Double Jogger, which like the previous product has a multitude of features which aim to make your job as a parent and your hobby as a jogger much easier. The foot activated brake is an excellent safety feature which prevents any risk of your stroller trying to race you home should you accidentally let go of the handlebar. The handlebar has a rubber grip on it and is very broad but unfortunately not adjustable. Just in front of the handlebar is a genius tray for the parents to keep close-to-hand items like keys on with two cup holders to top it off! The canopy is shared between both of the seats unlike the BOB stroller and acts brilliantly to keep out the harsh weather but it doesn’t close all the way down to offer maximum protection however, it is great to provide shade from overbearing sun rays. This stroller is fairly bulky in comparison to others available on the market, but this comes with a luxurious amount of space within the stroller for the kids, it would no doubt feel less “claustrophobic” for the infants than other similar products. Also, despite the bulk, the stroller folds and assembles pretty easily and so is not difficult to store for later use or to travel with. An additional, small feature which can easily be overlooked but certainly does help is the step that the children can use the help themselves into the stroller. There are a lot of strollers out there that do not have this step, and those are the ones where the parents always have to lift the children into the stroller. For something with a bit of flair, this stroller certainly offers to add a sleek and contemporary style to your outings with the children. Practicality and durability were in mind when the Thule stroller was designed, with a hand activated brake to provide security that is fixed onto the adjustable handlebars, this is a great value for money stroller indeed. In comparison to other models available, the seats are quite private and are almost like the kids own mobile rooms with their own separate canopies too! They’re not so private with the peek through windows though, so you don’t need to worry, you can see your child all the while you are jogging if you want to. The flaps over the windows reseal magnetically so there’s no worry about it coming loose or flapping around. There is also plenty of underside storage which can be zipped up to keep all of the essentials you love to have with you safe. The fastenings inside the stroller are really secure and adjustable to your child’s shape and size without causing too much discomfort, just remember that it is important to keep them somewhat tight to reduce the children being thrown around so much when running at high speeds. There is a small lever on the backside of the stroller which when activated folds the stroller down, making it flat for storage which is quick, useful and convenient. The Thule stroller is also available in blue and red and there are plenty of accessories sold separately such as snack trays, organizers, and car seat adapters. The finale of the double jogging stroller reviews is every bit as great as the other featured strollers. With deep seats and canopies which extend very low down, this is also a stroller which offers a lot of privacy for the children compared to some of the others, so that they can enjoy the day out in their own world (also not without peeking windows!) and is very effective at protecting the children from the sun and the rain. Additionally, the canopies also sport side ventilation flaps made from mesh as well as there being a large mesh vent behind the seat, this keeps the air fresh and to maintain temperature for your children if you do have the canopies completely closed which shows its overall quality in design. The stroller has fantastic shock absorption that drastically reduces the impact from bumps, cracks, hills, and variations in the terrain which is a result of its large inflated rubber wheels and its state of the art suspension. It also has a great ergonomic padded handlebar that has a handbrake attached and a remote swivel toggle which allows you to seamlessly switch between the front wheel having swivel activated or being locked which gives an advantage over other models who only allow this switch from the wheel itself. Why Use The Best Double Jogging Stroller? Simply put, normal strollers haven’t been designed to tolerate the types of stresses and strains that occur when jogging. Not only would they be incredibly difficult to steer and control, but they would be unsafe for yourself and your kids that sit in them. The best double jogging strollers are designed for speed and traveling over various types of terrains, while everyday strollers are designed for simple maneuvering at walking pace. Typically, the best double jogging strollers have large wheels with durable treads and a fixed front wheel that is swivel free. These key design features mean that the stroller is able to travel over the bumpiest and roughest terrains at speed and as the front wheel is swivel-free. It won’t just spin around and veer off in any direction like a normal stroller would. 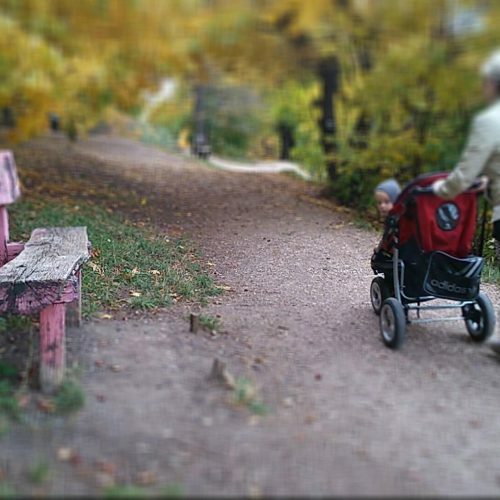 You would be right in thinking it’s not a great idea to have a jogging stroller for everyday use. The lack of maneuverability when navigating town would leave you frustrated as you’ll constantly have to be lifting the front wheel up to make turns. For this, the very best double jogging strollers have a front swivel wheel which can lock into place so that you have the choice between maneuverability or stability. This fantastic feature is well worth the extra cost as you’ll only need the one stroller! At what Age can you jog with a Baby? Before going on your first run with your baby in the stroller you should seek advice from your pediatrician and ensure you always read the manufacturers guidelines. It’s always a wise idea to check out the manufacturer’s website for recent recalls just to be on the safe side too. After that, the right age to start jogging with your baby is generally accepted to be above the age of 6 months, as this is the time they start to hold up and support their own neck and head. What Do You Think Is The Best Double Jogging Stroller? There are some amazing strollers out there for you and it’s definitely worth checking out all the options available because as you can see, the features can differ between products and the number of features as well as the material quality often reflect on the price. The best double jogging stroller for you and your children should have all the features you need, be durable and weather resistant and have bonus features aimed to make the product as simplistic and convenient for you as possible. To avoid making a purchase that you may regret, it’s best to think about the features you have seen such as adjustable handlebars, handlebar swivel control, and car seat adaptation. How would they benefit you? How would they fit your lifestyle? Ensure the stroller you buy is good value for your money by being all you need it to be and more.